Recorded at a small Jazz club in Vienna, Austria (a city more familiar with Mozart than the Mississippi Delta Blues) five years before the first of his five strokes, this long solo set, captured over three nights, finds Robert Johnson's legendary travelling partner in splendid shape. Chicago-based Shines even uncharacteristically responds to audience requests, vividly interpreting classics by Leroy Carr, Muddy Waters and Elmore James, as he samples broadly from a wide stylistic repertoire with his powerful, vibrato-rich vocals leading the way and spilling across some of the most thrilling slide guitar-keynoted fretwork this crowd had probably ever heard. From slowed down versions T-Bone Walker's "Stormy Monday Blues" and the traditional "St. Louis Blues" (two songs that he rarely performed live) to nearly a dozen solid examples of his own beguilling lyric invention and an extroverted quartet of bottleneck-suffused Johnson covers, it sounds like he has the fans in the palm of his hands. Penetrating examples of Shines' songwriting facility include the surging, hortative "I Don't Know", a bleak, pause-filled "Won't Be Your Fool No More", the autobiographical plea "Why I Sing The Blues So Sad" and the high-wire slide guitar inflamed "Sugar No More". Versions of the old-time Gospel hymn "Motherless Children", a brief take on the Windy City anthem "Roll and Tumble Blues" and Big Bill Broonzy's "Rocking Chair Blues" are equally moving. Liners author Bob Groom traces the few peaks and many valleys of Shines' life and times with accompanying photos and song-by-song commentary. 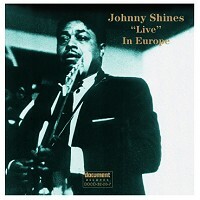 The sound quality could be better, but Shines was woefully under-recorded in his prime and concert tapes by him are rare.